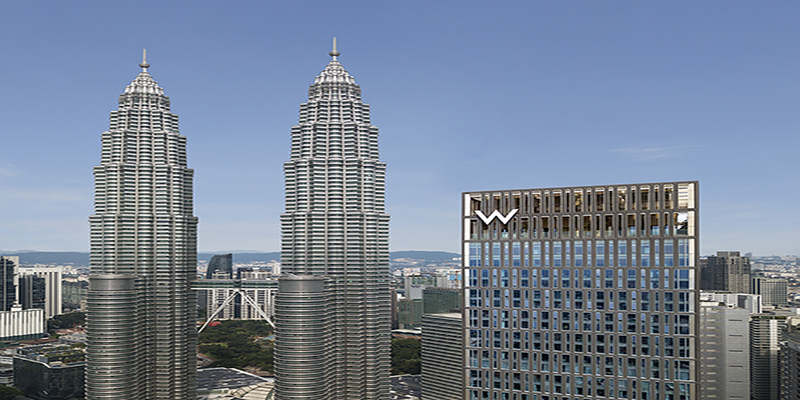 Kuala Lumpur, Malaysia, 2018-Aug-31 — /Travel PR News/ — W Hotels Worldwide, part of Marriott International, Inc., today (08/28/2018) announced the opening of W Kuala Lumpur, marking the iconic brand’s first-ever hotel in Malaysia. Owned by Tropicana Corporation Berhad, W Kuala Lumpur opens its doors in the heart of the capital, steps from the world-famous Petronas Twin Towers. Through bold, innovative design, W Kuala Lumpur immerses guests in the city’s wildly lush greenery, globally renowned cuisine, centuries-old history and growing appetite for playful luxury. W Kuala Lumpur combines an inexhaustible mix of old and new colors, aromas and sounds that blend effortlessly together in a cultural festival for the senses. A distinct design feature at W Kuala Lumpur is the pixel – or dot. It is cleverly integrated throughout the hotel and is used to create a bigger picture inspired by a broader multicultural Malaysia made up of many ethnicities. Upon arrival, guests are welcomed by larger-than-life traditional batik motifs, a nod to ancient artwork of the region, blended with sleek metal accents. The city’s abundant plant life is pulled into the space via bamboo-inspired chandeliers set against an ever-changing wall of lights, a representation of the new technology that is enhancing the cityscape. At the Welcome area, guests check in among modern nods to the jungle. Streaming LED lights hang from above, playfully mimicking waterfalls, spotlights alternate along the floor like a flowing river while the ceiling patterns depict an artistic interpretation of Kuala Lumpur’s topography, and chandeliers show off the shapes of spinning Malay toys known throughout the country. Born from the bold attitude and 24/7 culture of New York City, W Hotels, part of Marriott International, Inc., has disrupted and redefined the hospitality scene for nearly two decades. Trailblazing its way around the globe, with over 50 hotels, W defies expectations and breaks the norms of traditional luxury wherever the iconic W sign lands. With a mission to fuel guests’ lust for life, W ignites an obsessive desire to soak it in, live it up and hit repeat. The brand’s provocative design, iconic Whatever/Whenever service and buzzing Living Rooms create an experience that is often copied but never matched. Innovative, inspiring and infectious, the brand’s super-charged energy celebrates guests’ endless appetite to discover what’s new/next in each destination, to see more, feel more, go longer, stay later. For more information on W Hotels, visit whotels.com/theangle or follow us on Twitter, Instagram and Facebook. W Hotels Worldwide is proud to participate in the company’s award-winning loyalty programs – Marriott Rewards, The Ritz-Carlton Rewards, and Starwood Preferred Guest (SPG). The programs, operating under one set of unparalleled benefits, enable members to earn points toward free hotel stays, achieve Elite status faster than ever, and seamlessly book or redeem points for stays throughout our loyalty portfolio of 29 brands and more than 6,700 participating hotels in 130 countries & territories. To enroll for free or for more information about the programs, visit members.marriott.com. This entry was posted in Hotels, Luxury, Travel, Travelers and tagged Anthony Ingham, hotel, Kuala Lumpur, Malaysia, Marriott International, W Hotels Worldwide. Bookmark the permalink.